Recounting the incident that led to the victim’s death, the father of two said this was actually the second time he was visiting her house in Lagos. He said: “I met her online sometime between September and October 2014 on facebook and we began to chat. Early this year she came to Sagamu to visit me and she spent two days with me. She actually came on Friday and went back to Lagos on Saturday. “I have an apartment where I work in Sagamu but my wife and children live in another apartment in Ibadan. I came to see her in Lagos around first week of March where I spent the weekend with her. This was the second time I visited her. “On that fateful evening, we went out, spent quality time together and later retired to her apartment and slept. ‘’At about midnight, she began to complain about headache and then she started coughing. She coughed for a long while. It was when the coughing persisted that I had to go and knock on her next neighbours’ door to help me locate a nearby hospital, since I am not familiar with Lagos terrain. “So with the help of her neighbours, we went to a nearby private hospital (names withheld). After examining her condition, she was referred to the general hospital. At this time, her condition was getting worse, yet I did all I could to get her to the hospital. 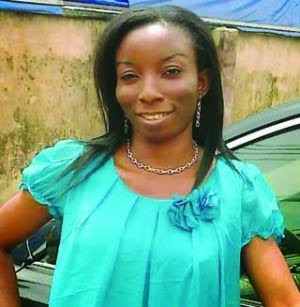 Ezekiel was arrested over the death of his facebook lover, Adekemi, who died during his visit to her apartment at 5, Folorunsho Street, off Ajayi Road, Ogba. It was learned that the suspect’s wife who works with Nigerian National Petroleum Corporation, NNPC, in Ibadan, was at the State Investigation Department, SCID, Panti, last Wednesday to see her husband.